I've always been intrigued at how Final Fantasy has shifted over the years. The series started off with turn-based combat, a standard for many JRPGs over the years, but at some point it began to evolve into something different. New ideas, new mechanics; rooted in Final Fantasy staples, but clearly attempting to break away from tradition. The endpoint of that evolution is currently Final Fantasy XV, with its real-time, action-heavy Active Cross Battle System. Hell, even Final Fantasy VII Remake looks to be switching to real-time combat over the turn-based nature of the original. 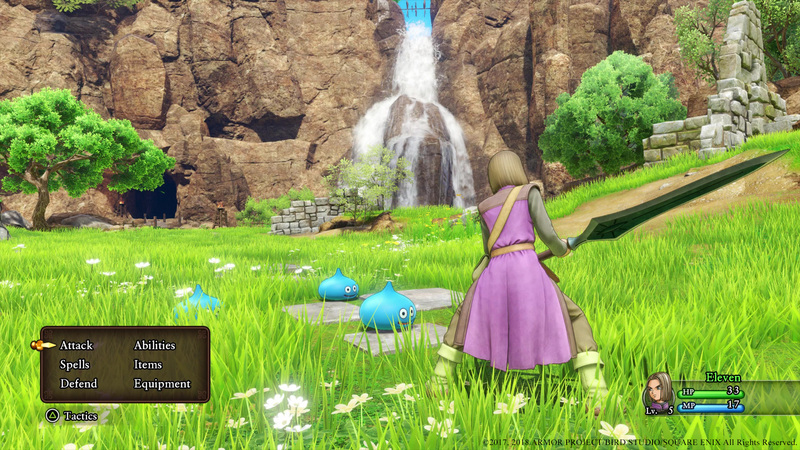 My guess has been that Square Enix feels it can play around with Final Fantasy because it has Dragon Quest. Before, the two properties were rivals of a sort, but Squaresoft and Enix merged to become Square Enix in 2003. 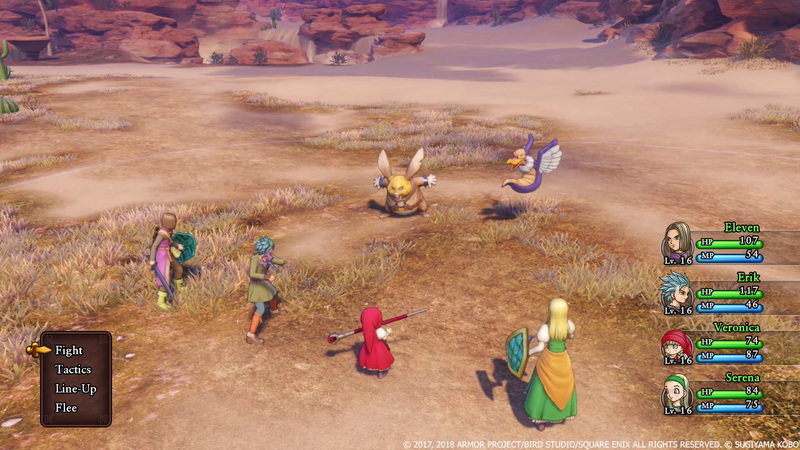 That left Dragon Quest in a position to protect those older JRPG traditions, while Final Fantasy always used cutting edge technology to aim for a new feeling. These are the thoughts going through my head playing a small snippet of Dragon Quest XI: Echoes of an Elusive Age on PlayStation 4 at a pre-E3 event. 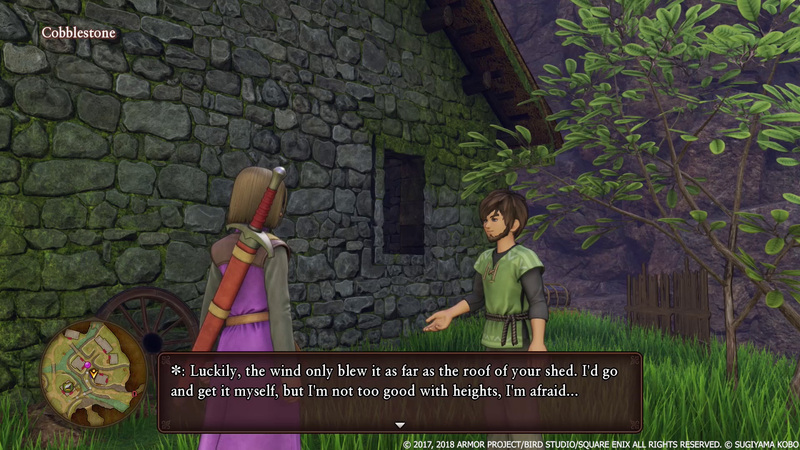 My connection to Dragon Quest has never been as strong as some of my colleagues: I played and loved Dragon Quest VIII on PlayStation 2, but I never got around to trying Dragon Quest IX on Nintendo DS. (Dragon Quest X is a massively-multiplayer online game that Square Enix hasn't bothered to bring to our shores.) My feelings on the series as a whole are muted, making me one of those fans Square Enix is aiming for with the latest entry. Old school in look and feel. 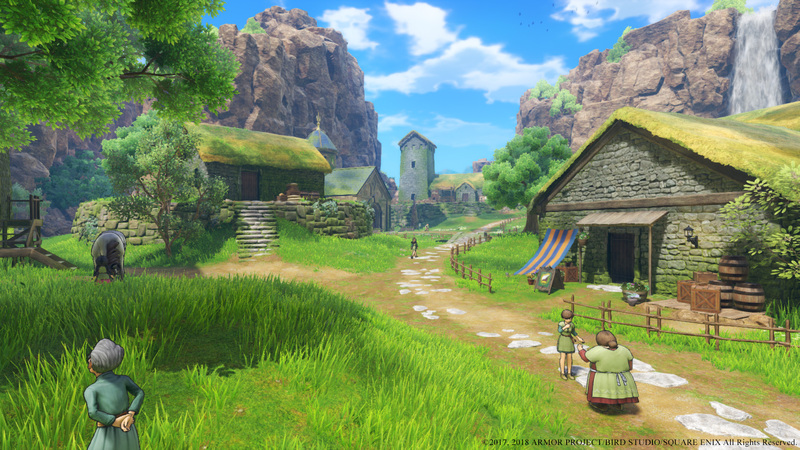 Sitting down with Dragon Quest XI is... quaint. It's clear that the game was built with the latest technology, as the wide-open spaces that form the game's environments are richly-detailed and brightly colored. It's simple on the surface, looking like a playable cartoon when you're wandering through a city or the wilds. Monsters bounce and jeer in front of you, crowds mill about in cities, and the grass sways in the breeze. There's a full day-night cycle and the lighting is actually a bit more realistic than I think fits with the character designs, but it looks great. 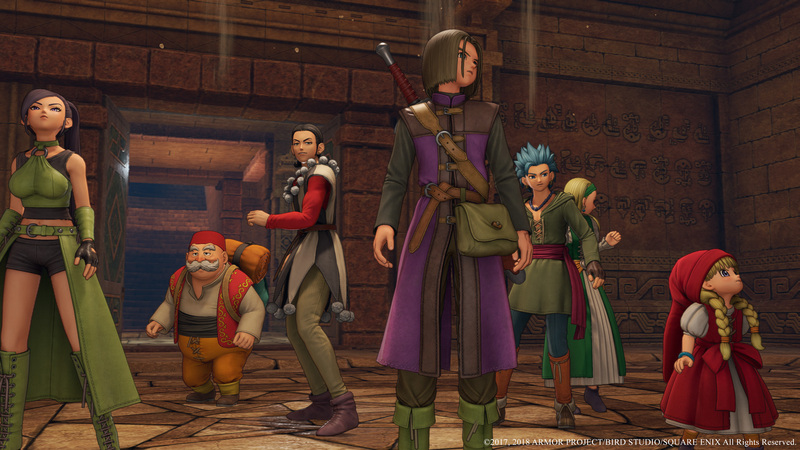 Despite the visual sheen, Dragon Quest XI feels like a PlayStation 2 RPG that has gotten the remaster treatment. It delivers its combat mechanics and exploration in such a straightforward, no-nonsense manner. 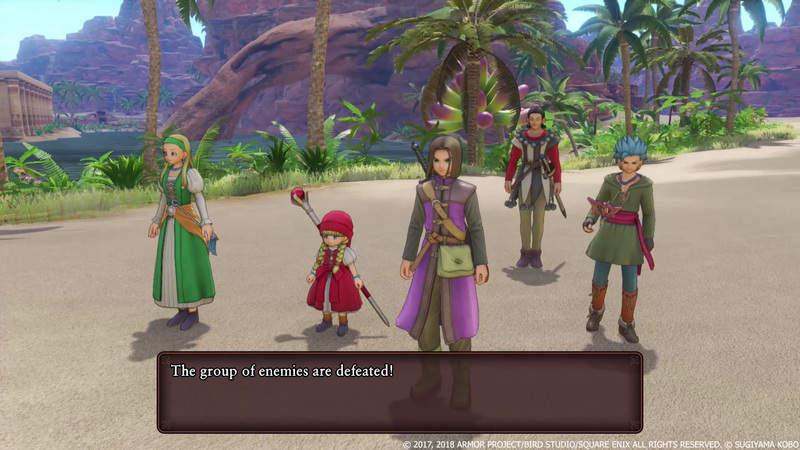 In the same way that games like Bravely Default and Octopath Traveler remind players of classic JRPG titles, Dragon Quest XI has found a way to harken back to an older time. Even the package itself is classic: there's no downloadable content, no microtransactions, no online-enabled modes. The game avoids everything about modern gaming in a charming, endearing way. The demo starts off in the town of Cobblestone, where our hero first begins his journey. A birthmark denotes the main character as the Luminary, a hero destined to do great things. Before I got to the adventure though, it was time to familiarize myself with the town. Every person in town has something to say, with certain folks sporting an icon letting you know they have a quest available. One older man wanted me to find his son's feather, which had floated on top of a house. No weird movement mechanics appear here; just basic jumping will eventually find you on top of the correct house. From there I spent my time trying to jump on top of everyone's homes and was rewarded with a little bit of treasure. Eventually, I left Cobblestone on my journey to the capital city of Heliodor to present myself to the King. 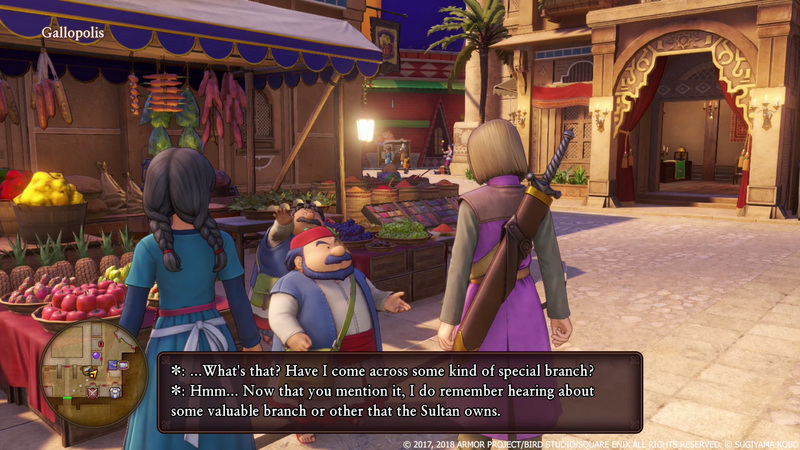 Trailers may have given the impression that Dragon Quest XI is open-world, but it's not. Instead, it has sizable chunks you can wander across connected by specific pathways, just like older RPGs. Given the expanse you can explore, Square Enix made a number of quality-of-life changes to the series. For one, you can summon a horse to ride at anytime, giving you a speedy way to travel. (You can run over monsters!) 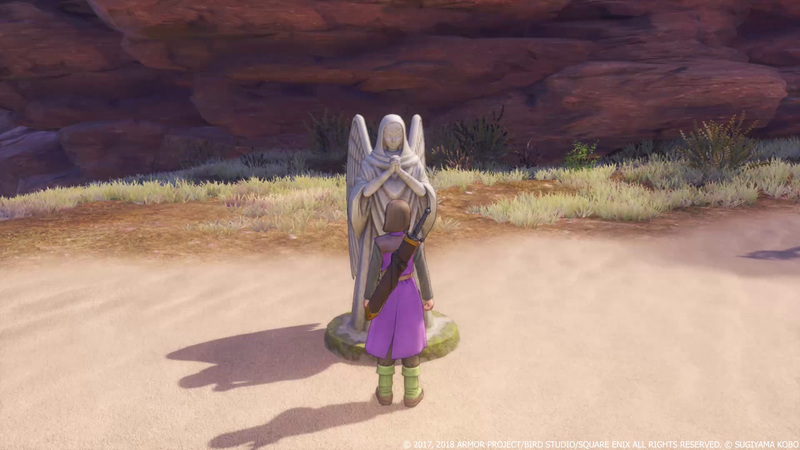 Second, while the series has previously left saving to churches in towns, Dragon Quest XI offers holy statues and campfires in the field that you can pray to for rest and recovery. Statues, campfires, and bells come together in handy locations that let you save, rest, and recover your horse. Like Dragon Quest IX, monsters appear in the environment. You can avoid them, let them run into you, or slash them with your sword to gain initiative in combat. That combat is wonderfully turn-based: you select from a list of commands and your party members execute their attacks. There's a tiny joy in seeing characters attack and then run back to their designated spots. The sound effects are lovingly 8-bit too, from the spell casting noise to the victory sounds. In Heliodor, the hero presents himself to the King, thinking everything is going to go swimmingly. Unfortunately, the king orders you jailed, because the Luminary might also be the Dark One: the logic being that light can cast shadows. The impending jail time marked the end of the first part of the demo. 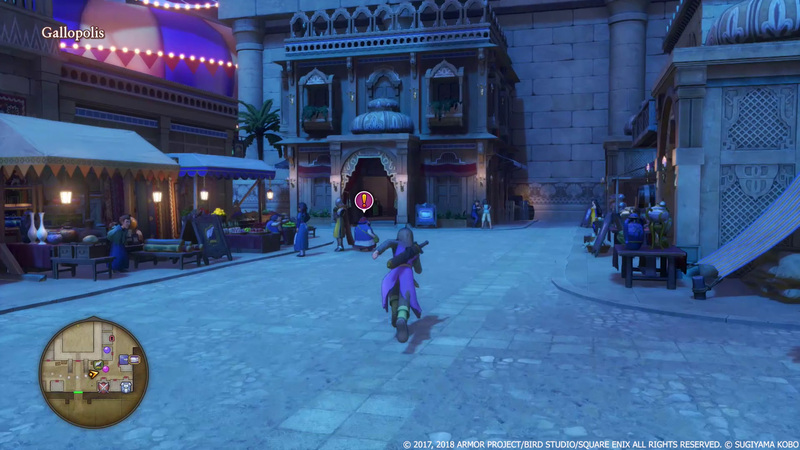 The second part jumped ahead "around 10 hours" into the game, according to Square Enix, leaving behind the grasslands around Cobblestone for the desert-bound city of Gallopolis. At this point, the hero is joined by a few other party members. There's Erik, a dual-wielding thief; Serena, a young blonde woman who acts as the party's healer; and Veronica, a tiny girl who also happens to be a powerful offensive mage. It was hard to get a read on Serena, but the calm, cool nature of Erik and headstrong attitude of Veronica definitely made themselves apparent. 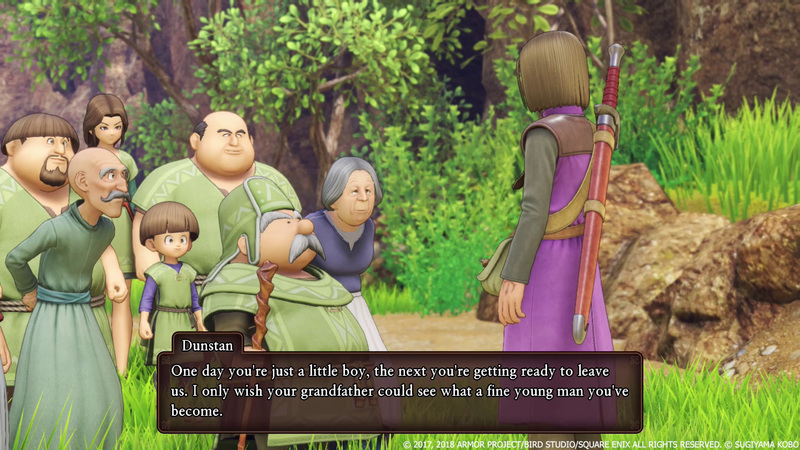 It's worth noting that Dragon Quest XI has full English voice acting, while its Japanese counterpart had none. It's one of the extra changes being made for the localized version of the game, additions which include improved menus, a faster sprint, and a first-person camera mode. Here, it helps establish the characters much quicker than text alone, though this is a brief demo. I wandered the desert outside of Gallopolis for a bit, but I ultimately became more concerned with seeing where the story was going to take our hero. The party is in town looking for an artifact, a bit of the World Tree. The local prince will help you get the artifact from the royal family, but you have to do him a favor. To ascend the throne, he needs to win a horse race; the problem is he can't ride a horse to save his life. His plan is to have the hero mount up in his place. Win the race, you get the artifact. This clandestine conversation plays out in in the background of a circus, and which also marks the first appearance of another party member. The magnificent Sylvando is performing, a sauve juggler and stage magician. With a showman's flourish, ever-present smirk, and a vocal delivery that sounds like Antonio Banderas in The Mask of Zorro, Sylvando looks like he might be a favorite of mine. Unfortunately, with his entrance, my time with Dragon Quest was over. Everybody in the squad has a niche. It's just wonderful to play a game that's clearly modern in terms of tools and resources, but classic in terms of mechanics. I'm not saying this is better than modern gaming, or modern Final Fantasy titles, it's just not the norm anymore, which makes this stand out. The overall look, the soundtrack and sound design, the turn-based combat; it all recalls an earlier era of gaming. (Persona 5 has turn-based combat, but feels more modern in terms of presentation.) 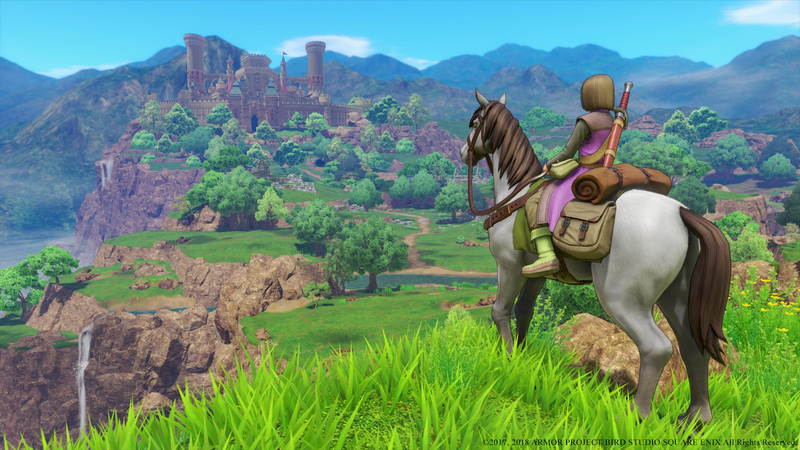 Dragon Quest XI: Echoes of an Elusive Age is the kind of game JRPG veterans will want to curl up with to remember days gone by. It's a warm blanket and comfy chair near a nice fire. It's that feeling of nostalgia without actually being something old. And I think a lot of folks will be happy with it when it's finally in their hands. 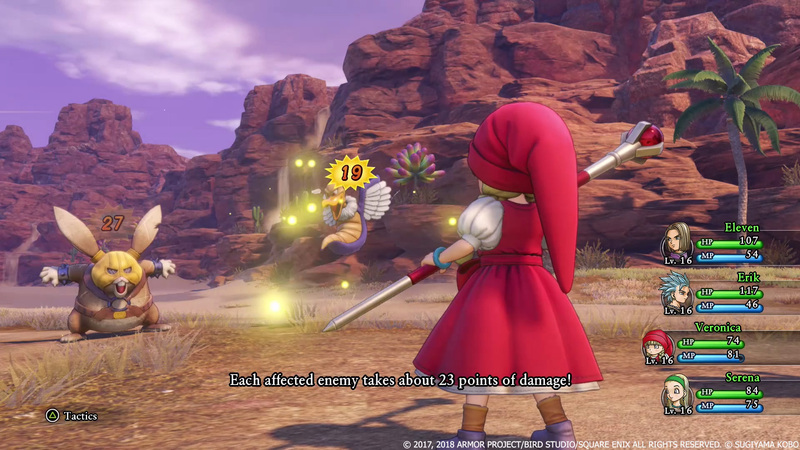 Dragon Quest XI: Echoes of an Elusive Age is coming PlayStation 4 and PC (Steam) on September 4, 2018. Tagged with Analyses,	PC,	PlayStation 4,	Role Playing Games,	Square Enix.